2. For tomato passata, half fill a medium saucepan with water and bring to the boil. Add tomatoes and cook until skin begins to peel away from flesh. Drain, peel skin and deseed. Slice flesh into quarters. 3. Place a medium saucepan over a high heat. Add oil and garlic and cook for 30 seconds. Add tomatoes, basil leaves, water and sugar and season with salt and pepper. Stir to combine. Bring to the boil, reduce heat to low and simmer until sauce has reduced and thickened. 4. For filling, heat olive oil in a large frying pan. Panfry chicken until golden, remove from heat and shred. Add butter, leek and thyme to the pan and cook over a medium high heat until leeks have softened. Stir in flour and cook for one minute. Add stock and milk and cook, stirring continuously until mixture has thickened. Pour in cream and shredded chicken and stir well to combine. Add salt and pepper to taste and set aside to cool. 5. For crepes, sift flour into a medium bowl. Whisk eggs and milk in a jug and gradually pour mixture into flour, whisking continuously. Heat a large frying pan or crepe pan and add a knob of butter. Spoon 2-3 tablespoons of batter into pan and quickly swirl to cover base. Cook until golden, flip and cook for one minute. Repeat with remaining batter. 6. Grease the base of a large baking dish with oil and spread ¼ cup of tomato passata over base. Place a crepe on a large board and spread approximately ¼ cup of chicken mixture down the center. Roll up and place in baking dish. Repeat with remaining crepes and chicken mixture. Pour tomato passata over finished cannelloni and pour over cream. Top with parmesan cheese and for 25-30 minutes. 7. For salad, combine shaved fennel, radicchio and orange pieces in a medium bowl. Place honey, orange juice, oil and white balsamic in a small bowl or jug and whisk to combine. 8. 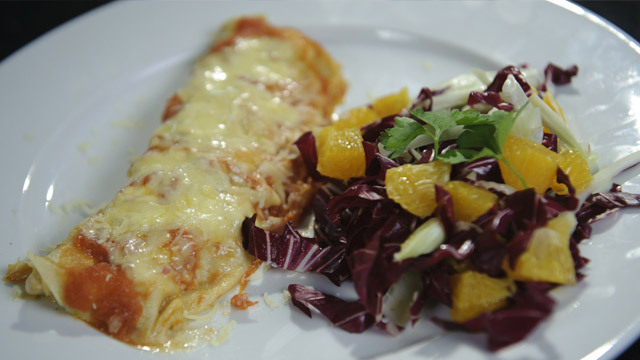 Serve cannelloni with fennel salad, a drizzle of orange dressing and garnish with a sprig of parsley. This entry was posted on October 5, 2010 at 3:24 pm and is filed under Cooking, Family, Musings, Random, Recipe. You can follow any responses to this entry through the RSS 2.0 feed. You can leave a response, or trackback from your own site. I love cannelloni and the mixture of chicken and leeks is especially comforting. Enjoy your sleepitime, my friend. Oh Oh. I ought not have peeked at this. It’s bed time. I sit here salivating and determined to only drink my water! Looks delicious, Amanda. This is definitely a dish I would order out in a heartbeat if I saw it on the menu. It looks absolutely delightful! It really looks delicious! All the ingredients are the kind I like. Thank you for another great recipe, Amanda. Very nice! I never put pasta on the same plate with salad but I need to start doing that because they really do work together quite well; especially an enclosed pasta like cannelloni. Very similar to quiche. Oh my goodness. Between you and Cindy, I’m going to gain 10 lbs. to night just picking … I think I misplaced my self-control.